Ellen's Game of Games :: Show Information :: RabbitTV GO! Multi-award winning television host, producer, writer, actress and entertainment powerhouse Ellen DeGeneres brings her hilarious, high-energy comedy to primetime this January with NBC's newest reality competition show, "Ellen's Game of Games." DeGeneres serves as host and executive producer of the hour-long comedy game show, which includes supersized versions of the most popular and action-packed games from her award-winning daytime talk show, "The Ellen DeGeneres Show." Contestants, who are pulled right from the audience, will have to maneuver massive obstacles, answer questions under crushing time pressure and face gigantic plunges into the unknown - all in a quest to win a big cash prize. 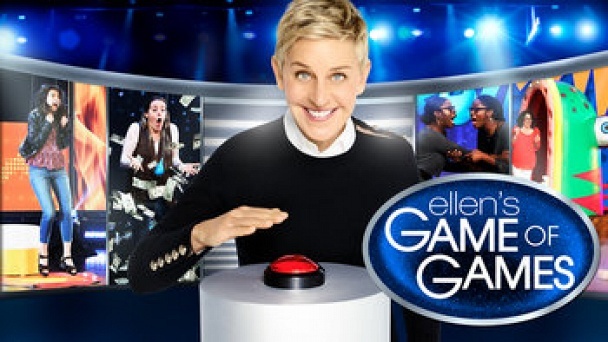 Every episode will feature DeGeneres' one-of-a-kind comedy and irrepressible personality, along with a unique roster of games, including Blindfolded Musical Chairs, Dizzy Dash and Scary Go Round. The thrill of the pressure-cooker situations and the instant wins will keep audiences on the edge of their seats. At the start, contestants play games over four rounds. The winner of each round advances to play Know or Go. The person who wins advances to the final round to play an epic game of Hot Hands, where he or she will have to guess as many answers as he or she can in a designated amount of time.